Storing Children's Art + School Work! I used to be a saver. I saved evvvverything. After our recent move and reno, however, my perspective has completely changed. The moving and storing and sorting of all of this “stuff” created such a burden on us all. There are things my mom saved that I so appreciate. Heck, that is the reason Bitsy ever came to be! So recently there has become this fine line - we thin ourselves out from the things that we really dont need, but save (and use!) the things that bring us great joy. And maybe we can even incorporate those things into our home’s decor and our daily lives. When my girls get home from school each day they are expected to empty out their own backpacks. With this creates sharing - they pull out their project from the day that they can’t wait to show me or they are pumped to hold up homework they handed in that came back from the teacher with a smiley face on it. We go through these things together - sometimes right then and a lot of times at the dinner table. They talk about their day and the work they have accomplished. Those papers/art projects then make their way upstairs with us at the end of each day and into each of their rooms. Every night I pile those papers into one of these Container Store boxes (labeled with their names). These boxes live on a shelf in our girls closets. I find this size to be perfect for the preschool work and older kid work. I made sure to put them in an easy to get to place in order that this task doesn’t become a hassle to complete each night! I try to write the date on them (if it isnt there already) and then I just easily slip them in on top. This way, everything is somewhat in the order of how it came home throughout the school year. In June after the last day of school I take about an hour with each daughter. We sit and go through all of their school work together - we talk (and laugh!) about the progress they made in their learning throughout the past year. They get to decide which work/projects are treasures they want to keep. Greer, of course, being so little wants to keep it all. I navigate her through each piece of paper and help her learn what is really important and special to hold on to. As they get older, this is something they can do on their own to learn organization! The next step! My mother-in-law gave the girls these Accordian-style Art Portfolio Folders a few Christmases ago. I adore them! They are inexpensive and you can personalize them with your child’s name and photo/s! 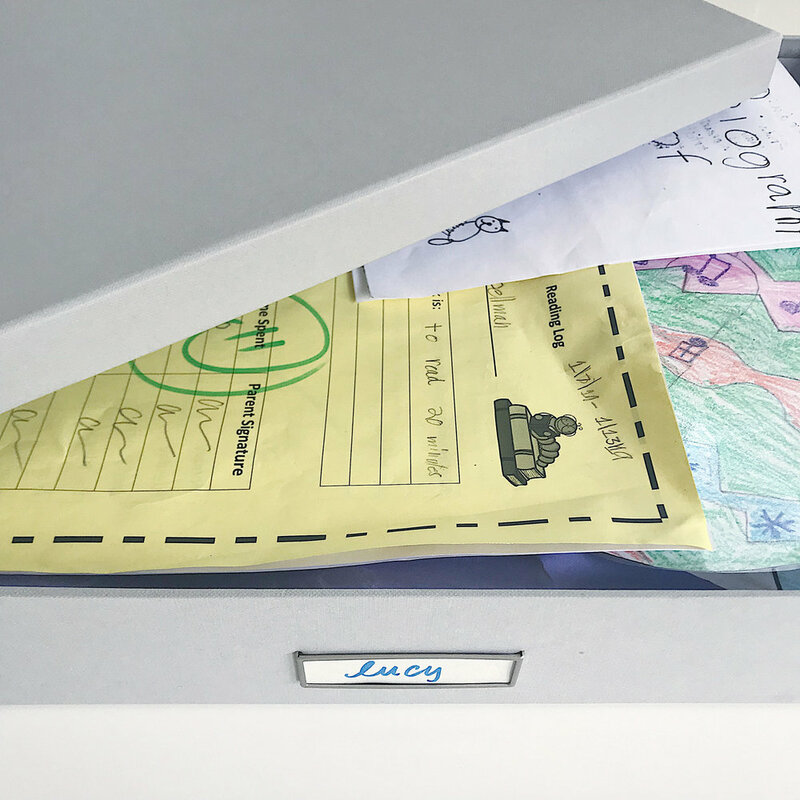 These folders are where we keep really special pieces (the handprint art, the project that showed the most creativity, the project or homework that you/they know they worked the hardest on). I labeled each section in order of school year and school name so it is organized and easy to see. Again, we also keep their Art Portfolios in an easy-to-access spot in their closets. Sometimes the stuff they bring home is so special it goes right in their Art Portfolio to keep forever (after living on the fridge for a while, of course!). Once this system is in place and you and your kids get into the swing, it is liberating! I always felt so much guilt throwing their work away. Now, I dont feel badly getting rid of most of it because at the end of the year I see what really is important and special to them and their journey and what is worth keeping. And if everything doesn’t fit in their Art Portfolio Folder, then we are forced to get rid of more and really dive deep into the important! By the way…The Art Portfolio Folders make a great gift! Especially for a 1st Birthday. New moms are always needing ideas and it is practical!